Sinem Beyhan, PhD, is an assistant professor at the J. Craig Venter Institute working in the Infectious Disease group. Dr. Beyhan’s research focuses on microbe-host interactions. 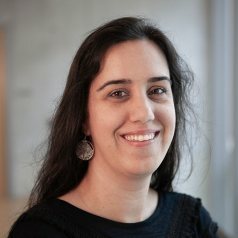 Prior to her appointment at JCVI, Dr. Beyhan was a post-doctoral fellow at the University of California, San Francisco, where she was awarded American Lung Association Senior Research Training Fellowship, American Cancer Society Postdoctoral Fellowship and NIH-NIAID Pathway to Independence Award (K99/R00). She received her PhD from the University of California, Santa Cruz in Microbiology and Environmental Toxicology, and her undergraduate degree from the Middle East Technical University, Ankara, Turkey. Molecular microbiology. 2010-12-01; 78.5: 1171-81. Identification and characterization of a phosphodiesterase that inversely regulates motility and biofilm formation in Vibrio cholerae. Journal of bacteriology. 2010-09-01; 192.18: 4541-52. Cell envelope perturbation induces oxidative stress and changes in iron homeostasis in Vibrio cholerae. Journal of bacteriology. 2009-09-01; 191.17: 5398-408. Indole acts as an extracellular cue regulating gene expression in Vibrio cholerae. Journal of bacteriology. 2009-06-01; 191.12: 3504-16. Journal of bacteriology. 2008-11-01; 190.22: 7392-405. Smooth to rugose phase variation in Vibrio cholerae can be mediated by a single nucleotide change that targets c-di-GMP signalling pathway. Molecular microbiology. 2007-02-01; 63.4: 995-1007. Regulation of Vibrio polysaccharide synthesis and virulence factor production by CdgC, a GGDEF-EAL domain protein, in Vibrio cholerae. Journal of bacteriology. 2007-02-01; 189.3: 717-29. Journal of bacteriology. 2007-01-01; 189.1: 388-402. Differences in gene expression between the classical and El Tor biotypes of Vibrio cholerae O1. Infection and immunity. 2006-06-01; 74.6: 3633-42. Transcriptome and phenotypic responses of Vibrio cholerae to increased cyclic di-GMP level. Journal of bacteriology. 2006-05-01; 188.9: 3600-13. Cyclic-diGMP signal transduction systems in Vibrio cholerae: modulation of rugosity and biofilm formation. Molecular microbiology. 2006-04-01; 60.2: 331-48.